Don't miss the CSE Winter Light Show Nov. 30, Dec. 1, 6, 7, and 8 with shows at 5:30, 6, and 6:30 p.m. each night at the Civil Engineering Building Courtyard. A Premiere Party with hot chocolate is Nov. 30. Don't miss this on-campus winter tradition! See a dazzling light show designed by students. The CSE Winter Light Show is a student-designed 3D outdoor experience featuring more than 250,000 LED lights set to music. All of the light features and much of the music is designed, sequenced, composed, and performed by University of Minnesota students. 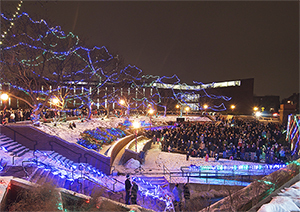 Now in its eighth year, the CSE Winter Light Show has become an annual campus tradition. The entire show will last about 15 minutes. The show is presented by the Tesla Works student group and sponsored by College of Science and Engineering Student Services. A Premiere Party is Friday, Nov. 30, 5-6:30 p.m. Free hot chocolate will be provided by the University of Minnesota Parent and Family Program while supplies last. Read more about the CSE Winter Light Show.